Since W. B. Gallie introduced the notion of essentially contested concepts (ECCs) in 1956, social science scholars have increasingly used his framework to analyze key concepts drawing “endless disputes” from contestant users. Despite its merits, the ECC framework has been limited by a neglect of social, cultural, and political contexts, the invisibility of actors, and its ahistorical character. To understand how ECCs evolve and change over time, I use a conceptual history approach to study the concept of philanthropy, recently labeled as an ECC. Using France during classical modernity as a case study, I analyze key events and actors from the concept’s inception in 1712 as a virtue of the Enlightenment to its triumph after 1789 as a secular alternative to Catholic charity, until its decline at the end of the nineteenth century as a new consensus emerged around the concept of solidarity. By introducing the notion of historically contested concepts, I make several contributions to research on ECCs, conceptual contestation, and conceptual change. I would like to thank my colleagues Joel Bothello, Anne-Claire Pache, and Greg Molecke for their wise suggestions on earlier drafts of this article. Thank you to Eugénie Bapst for her precious help on data collection and tracking definitions in dictionaries and encyclopedias. I also benefited from the guidance of archivists at the Hôtel de Ville and CEDIAS-Musée social libraries in Paris. 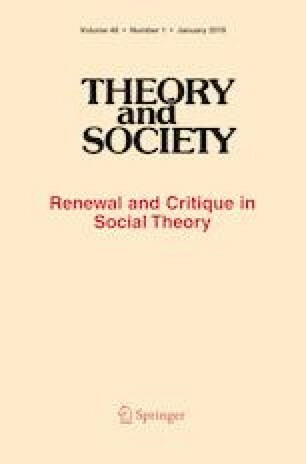 Finally, I thank the Editors and the reviewers of Theory and Society for their insightful comments. A version of this article was presented at the European Research Network on Philanthropy conference in Copenhagen, 2017. Earl, D. (2007). Concepts. The Internet Encyclopedia of Philosophy. https://www.iep.utm.edu/concepts/. Accessed 4 Nov 2018.